Meriwether Jeff Thompson was born at Harpers Ferry, Virginia, now West Virginia into a family with a strong military tradition on both sides. Thompson received basic training in military tactics in Charleston, South Carolina, but was not appointed to a military academy. He moved to Liberty, Missouri in 1847 and St. Joseph the following year, beginning as a store clerk before taking up surveying and serving as the city engineer. He later supervised the construction of the western branch of the Hannibal & St. Joseph Railroad. He married Emma Hayes in 1848. Thompson served as St. Joseph mayor from 1857–1860. Thompson also gained national attention in May, 1861, when he cut down a union flag from the St. Joseph post office flag pole and threw it down to an angry crowd of southern sympathizers who shredded it to pieces. Thompson was a colonel in the Missouri state militia at the outbreak of the Civil War. In late July 1861, he was appointed brigadier general of the First Division, Missouri State Guard. He commanded the First Military District of Missouri, which covered the swampy southeastern quarter of the state from St. Louis to the Mississippi River. Thompson's battalion soon became known as the "Swamp Rats" for their exploits. He gained renown as the "Swamp Fox of the Confederacy." Although Thompson frequently petitioned for the Confederate rank of brigadier general it was never granted. His brigadier rank came from his Missouri State Guard service. Thompson was reassigned to the Trans-Mississippi region. There, he engaged in a number of battles before returning to Arkansas in 1863 to accompany Gen. John S. Marmaduke on his raid into Missouri. Thompson was captured in August in Arkansas, and spent time in St. Louis' Gratiot Street prison, as well as at the Fort Delaware and Johnson's Island prisoner-of-war camps. In the fall of 1864, was part of a prisoner exchange and was able to join Price’s Army of Missouri during the 1864 invasion. 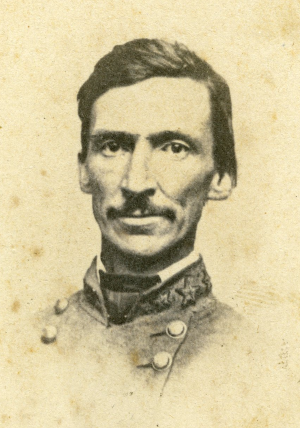 After Col. David Shanks was wounded and captured during the skirmishing near Jefferson City, Thompson was appointed to command Shelby’s Iron Brigade in Shelby’s Division. At the end of the war Thompson agreed to surrender his command at Chalk Bluff, Arkansas on May 11, 1865. About a third of his men refused to surrender. Shelby's Missouri Brigade, along with elements of Green's and Jackman's Missouri Brigades, lit out for Mexico. Some Missouri units disbanded rather than surrender their colors. Many men simply went home. After the war, Thompson moved to New Orleans, where he returned to civil engineering. He designed a program for improving the Louisiana swamps, a job that eventually destroyed his health. He returned to St. Joseph, Missouri in 1876 where he succumbed to tuberculosis. He is buried in Mount Mora Cemetery in St. Joseph, Missouri.